The Big 6 Australian Banks Run By Globalist ? HSBC is the number one shareholder in all the big four banks. HSBC Custody Nominees (Australia) Limited is listed as the number one shareholder for all of the Big Four Banks. It is a wholly owned subsidiary of HSBC Holdings Plc - You Know... HSBCBANK - Yes, that's right... HSBC Bank owns more than 10% of all of the big Four. The Federal Reserve Cartel – The Eight Families who own the USA .. The eight Families who own the USA also own Australia and New Zealand. Who owns Bank of America, JP Morgan Chase, Citigroup and Wells Fargo? HSBC. Stuart Gulliver | Revolve (Jewish). He was succeeded on 21 February 2018 by John Flint. ... "Bloomberg Businessweek Executive profile: Stuart Gulliver". ... "Revealed: Swiss account secret of HSBC chief Stuart Gulliver". ...... Early life and education Sir Martin Stuart Sorrell was born in London on 14 February 1945 to a Jewish family. The Globalist Banksters own many Australian Corporations including the private mainstream media and they have too much influence in SBS and ABC TV channels. The Bankster's influence and money donations to the Liberal/National, Labor and Greens political parties results for them having similar major policies, all designed to achieve the same results. It might be instructive to learn a bit about the history of our banking system, particularly the Commonwealth Bank…. In 1914 the Commonwealth bank began financing primary producers, ushering in the golden age of our country. “Riding on the sheep’s back” it was called. The money the bank raised helped finance the government to pursue WW1. The Governor boasted that it could have easily financed two such wars, the bank of the people was so solvent. Up until 1924 the Commonwealth bank financed businesses, home buyers, manufacturers, primary producers, and in the process created a vibrant and rich economy. The profits the bank made were ploughed back into the economy to enrich it even further. Throughout this period the private banks enjoyed a cordial relationship with the Commonwealth bank. In 1924 the Director of the Commonwealth bank, Sir Denison Miller died. With him removed from the scene the Bruce-Page Administration brought in a Bill to amend the Commonwealth Bank Act by taking the control of the Commonwealth Bank out of the hands of the new Governor and placing it in the hands of a directorate, composed ( in addition to the Governor of the Bank and the Secretary of the Treasury) of a body of financial magnates. This is…. Then in 1914, came the war, and with it an Amending Act giving the Bank power to raise its capital of $20 million, and to take over other banks and savings banks. The Bank did not at this period make use of either of these powers, but the services it rendered to the people of the Commonwealth were immense. Under the regime of the private banks, the flotation expenses of a loan in London, which Australian Governments would have had to pay, were 6%: but the Commonwealth Bank floated $700 million of loans for a charge of 0.56%, thus saving Australians some $12 million in bank charges. Even then the Bank made a profit of 0.2%. With (and sometimes without) the assistance of the private banks, it saved the Australian primary producer from stark ruin by financing pools of wheat, wool, meat, butter, cheese, rabbits, and sugar to the total amount of $872 million. It found $4 million for the Commonwealth Fleet of Steamers, which again saved the primary producer from ruin through lack of transportation facilities to his market overseas. It enabled Australia to transfer abroad, with the maximum efficiency and minimum expense $7,121,902 for the payment of her soldiers. Of course, during the war, the Commonwealth Bank Board, had from time to time, to create some money. Of the $3,074 millions of borrowed money S776 millions were in the form of Treasury Bills (Aust. Statistics Bulletin 188) and the Board also increased the Note Issue from $95 millions in 1939.
to a peak circulation of $405.4 millions in 1945 (Commonwealth Bank Report 1945). 1t had also in its Special Wartime Deposit Account, at June 30, 1945, $482 millions of the private banks’ surplus funds, on which it paid interest at three-fourths of one per cent, and it is more than likely that these funds had to earn interest. In general, however, it can be stated that the Commonwealth Bank Board created as little money as they could, and apparently worried a good deal over what they did create. Whilst on this subject, it might be as well to remind Australians that at June 30 1947, the national debt stood at the imposing figure of $5,534,248,000 ($731.66 per head), while the annual interest on this debt was $162,417,446 (about S80 for every family of four). These figures constitute a magnificent testimonial to the insanity of our financial system. Every blow we struck for freedom during the war shackled our limbs with another chain of interest-bearing debt. In 1943, under the stress of war, England and America began to cooperate in a Lend-Lease arrangement. This soon became a great international “clearing-house” for commodities, and the quantity of them “cleared” without the use of money reached enormous proportions. International financiers were alarmed. This sort of thing simply had to be stopped. On July 1st. 1944, the delegates from 44 nations met at Bretton Woods, New Hampshire, in the United States. There they found an Agreement already prepared for their signatures, and they were asked to sign upon the dotted lines. It took three weeks to induce them to sign, but eventually they all did. The Australian delegate (L.G.Melville) made it clear that his signature was not to be taken as a recommendation to the Commonwealth Government and Mr Curtin definitely stated that no Australian delegate had been authorized to sign any agreement, but only to sign a report concerning certain recommendations, which did not bind the Australian Government in any way. The Bretton Wood Agreements would take away from all nations the power of either increasing or decreasing their currency (except within very narrow limits) without first obtaining the assent of an International Monetary Fund – which international financiers will control through its directorate, in the same way as Australian financiers until recently had controlled the Commonwealth Bank. This International Monetary Fund was to be backed by a similarly controlled International Bank which would, to the extent that it saw fit, lend out money at interest for reconstruction purposes, provided always that those purposes were productive and profitable for the Bank. Money lenders and financial institutions throughout the world would be cordially invited to subscribe to these loans. The world would continue on its course but henceforth all human activity would be bound and increasingly burdened with the chains of interest- bearing debt. On November 19, 1946, Cabinet Ministers decided after a nine hours’ discussion to recommend to the Labor Caucus that Australia should ratify the Bretton Woods Agreements. Mr Chifley, then the Labor Prime Minister, led the move for ratification, but the Caucus by a narrow margin decided to defer their decision pending consideration by a special interstate A.L.P. Conference. The latter was never held and the Caucus was finally persuaded by the Media and by lobbyists both local and foreign to act in favour of the agreements. On March 20, 1947 the International Monetary Agreements Bill, formally ratifying the Bretton Woods Agreements, was passed by the House of Representatives after a perfunctory debate. The voting was 55 for and 5 against. The Bill passed the Senate on March 25, 1947 and became Law. It is difficult to give satisfactory reasons for the actions of the Chifley Administration and the Australian Labor Party. There was a universal desire to form some sort of world-wide organisation which might possibly result in a well-functioning peaceful world. There is a great deal of evidence that the “One-world” global carrot, consistently dangled before the donkey’s nose, was of great use in sending the donkey down the road that international finance desired it to travel. On August 6, 1947, Australia, in the person of Mr Makin, signed the articles of the International Monetary Fund and the International Bank at Washington, U.S.A. She was the forty-fifth victim. From then on, the operation of what was the Peoples’ Bank was gradually undermined until today it is just a private corporation. It is no longer a Peoples’ Bank. The Commonwealth Bank gradually assumed the role of a Central Bank and in 1959 this role ended with the introduction of the Reserve Bank Act of 1959 which saw the establishment of The Reserve Bank. This last action virtually brought about the demise of the Commonwealth Bank as the Peoples’ Bank and a further nail was put into the coffin when the Commonwealth Government decided to sell off part of the Commonwealth Bank. The Prospectus was dated 5 July, 1991. It was issued on that day and was also lodged with and registered by the Australian Securities Commission on the same day. This was preceded by The Commonwealth Banks Restructuring Act 1990, which, among other things amended the 1959 Act to provide for the conversion of the Commonwealth Bank into a public company. Experience shows that all such reassurances were completely worthless. 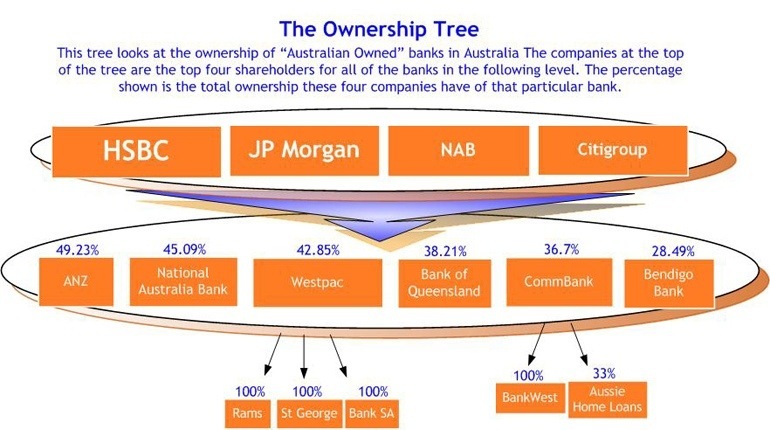 By 1996, the original 100% ownership of Australia’s Peoples’ Bank by the people of Australia as a whole had passed through stages of 70%, then 50.1% and finally grounded to zero. The word Privatisation is derived from the Latin privare which means to deprive. With the death and burial of their Commonwealth Bank, the citizens of Australia were deprived of their patrimony. They no longer possessed a common wealth. The latter had become the private wealth of greedy individual financial investors and exploiters. In February 1948, in his preface to the twelfth edition of his booklet The Story of the Commonwealth Bank, D.J. Amos wrote, “In the present (twelfth) edition, the story is brought to its final conclusion, in the surrender by Australia of its control over its own currency to the International Monetary Fund and Bank. In future (the Commonwealth Bank being again reduced to servitude) these two great foreign institutions will be free to deal with our people and our living standards as they see fit”. As we know, that was not the final conclusion but only the beginning of it. The stage had been set for complete foreign control, but the dismantling of the Commonwealth Bank had to be effected first. Here virtually ends the saga of the Peoples’ common wealth Bank. In 1960, the Reserve Bank took over the role of Central Bank from the Commonwealth Bank. Like other trading banks, the Commonwealth Bank is today completely privatised and subject to Reserve Bank controls. The Federal Government could direct the Reserve Bank to adopt a completely different policy to that which results in ever-escalating debt, crushing taxation and insidious inflation. For example, interest rates could be reduced to the point where they were sufficient to meet the administration costs of creating and administering credit. New money could be made available as a credit, instead of debt, for financing consumer discounts as a major part of an anti-inflation policy. But none of these and similar steps will be taken until a more enlightened public insists that the chaotic disintegration of marketplace activity can only be halted by a reversal of present credit policies. Eventually this must happen, but only after the situation gets even worse leading to complete economic anarchy. There are three features of this story which stand out clearly. 1. That of all the Administrations which have carried on the Government of Australia, two of them are pre-eminent for the injuries they have inflicted upon the people they were appointed to serve, The Bruce-Page Administration of 1923-29 and the Chifley Administration of 1945- 49. 1 The first enslaved to domestic financiers an institution which had stood between Australia and ruin during the first World War, and could have been used to create permanent prosperity in times of peace. The second rescued that Institution from domestic slavery only to hand it over to a far harsher enslavement abroad and from which it can only be freed, if at all, with extreme difficulty. 2. That institutions, no matter how excellent they may be, are of little permanent use to the masses of the people who do not understand the value of them. The right of the people of this Commonwealth to expand or contract financial credit in accordance with their needs, by means of a Commonwealth Bank was something that Australians should have safeguarded with the same jealousy as they safeguard the right to vote. They did not do this, so when the artificial depression of the thirties burst upon them they were exposed without defence to domestic and foreign financiers who knew no mercy. Today, thanks to the International Monetary Agreements Act of the Chifley Administration they are just as powerless to help themselves against any future depressions which those same financiers may be preparing for them. 3. That after the signing of the Bretton Woods Agreements, International Finance now had complete control over the policy of the Commonwealth Bank, and through it over the policy of the entire banking system of Australia – no matter in whose hands the Administration of the various banks may rest. International Finance can be trusted to ensure that the banking system in Australia remains in servile obeisance and its services used, not for the benefit of the people, but to further its own policy of power over people and profits before persons. Shareholders’ interest comes first; the rich must be allowed to get richer even if it means the poor get poorer. From Reserve Bank of Australia Bulletin November 2001. Table H.7 As at 30 June 2001, the level of Net foreign debt (net amount owed by the Australian public and private sectors to foreign entities) was $310 952 million. Alex Jones Infowars interviews American Indian Russell Means who talks how American has become one huge Indian Reservation. Russel Mean passed away in 2012. Alex Jones interviews Russell Means who talks about the decline of the American culture. This article was originally written to support Robbie Katter’s bill to introduce state banking, under the name of a Rural Reconstruction and Development Bank. The Abstract of the research paper below by Cockfield and Botterill shows that agricultural returns in the past five decades have not kept ahead of increasing costs over which primary producers have little control.